[By Nick] Dubba and I have been meaning to get Cumberland Farms (aka Cumby’s) on the blog for awhile now but we just haven’t gotten around to it. With the current lack of many new enticing products on the shelves, why not finally give their ice cream a shot? For those who don’t know, Cumberland Farms is a chain of convenience stores/gas stations primarily throughout the Northeast. I know what you’re saying “Ice cream from a convenience store?” Don’t forget Stewart’s is basically doing the same thing and has won quite its share of awards at the World Dairy Expo. 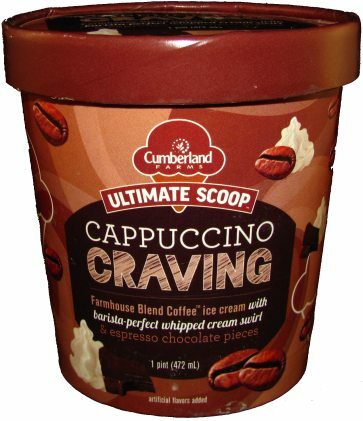 Cumby’s was doing a 2/$6 deal last time I was there so I decided to take advantage of that deal and grabbed their Cappuccino Craving along with another flavor that will be covered in the future. Is it me or does this flavor sounds like it has some serious potential? If you really think about it, it’s a lot like Ben & Jerry’s Coffee, Coffee BuzzBuzzBuzz! but with the addition of a whipped cream swirl. While CCBBB is my current favorite coffee flavor that includes mix-ins, I did feel like it was missing something and Cumby’s might have figured out what. The only thing that worries me is that whipped cream swirls always sound good in theory but never quite work. Let’s remove the lid and find out if they can deliver. Blah! The plague of buying ice cream from a convenience store strikes again! 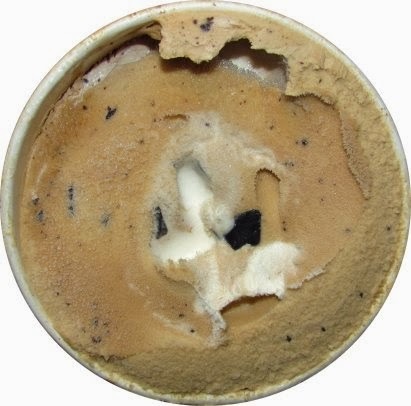 It looks as if the top layer of the ice cream has gotten freezer burnt. Luckily that’s the only extent of the damage so it’s easy enough to remove. The base is a lot more premium than I was expecting. It’s actually on par with Ben & Jerry’s but just a tad bit less creamy. Now let’s move on to the flavor… Suffice it to say, the coffee base tastes cheap. Come to think about it, it exactly what you’d expect out of convenience store coffee. Thankfully there are the espresso chocolate pieces. They add a more quality coffee flavor with hints of chocolate. They remind me of the ones found in CCBBB albeit shorter and thicker. The star of the pint has to be the whipped cream swirl. Out of all the swirls I’ve encountered, this one ranks up near the top. I don’t know how they did it but it tastes like fresh whipped cream. It’s nowhere near that crud you find in cheap aerosol cans. It tastes as if someone just made the whipped cream and stirred it into the ice cream. Sure you lose the airy texture you associate with whipped cream but I’ll be darned if the flavor isn’t dead on. Now if only there was a way I could transfer this swirl into CCBBB. That would seriously be some dangerous stuff right there. I know it wouldn’t happen but a man can dream, can’t he? For my first experience with Cumby’s ice cream, I have to say it beat my expectations. If they were to change the coffee base, this could possibly dethrone Ben & Jerry’s. As is, the only reason to buy this flavor is the whipped cream swirl. Verdict? Convenience store quality coffee ruins what would be a perfect flavor. Buy Again? Possibly but only to have that swirl again. Just bought the Cumberland Farms Butter Pecan Ice Cream.....what a disappointment!! No pecans - well, maybe a few! I was so disappointed that I actually searched through the entire container and I found about 10 pieces - mainly bits - not full pecan nuts! Come on Ari...Owner of the family business, you show a picture of a scoop of ice cream just chock full of nuts and you have a "promise" on the side of the container where you brag about the quality of the product and how proud your family is of the quality, also...... I suggest you open a container and try it...and then fire your quality control staff!!! 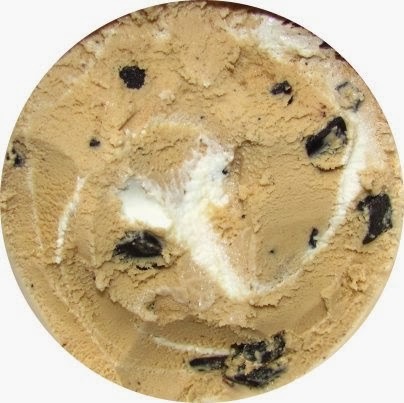 The Farmhouse Creamery Chocolate Chip is one of the best I've ever had, from a cold cripsy chocolate addict point of view!